In direct spinal exercise there are three main types of movement: Extension, flexion, and rotation. Spinal extension occurs when we bend backwards, while spinal flexion involves forward bending. 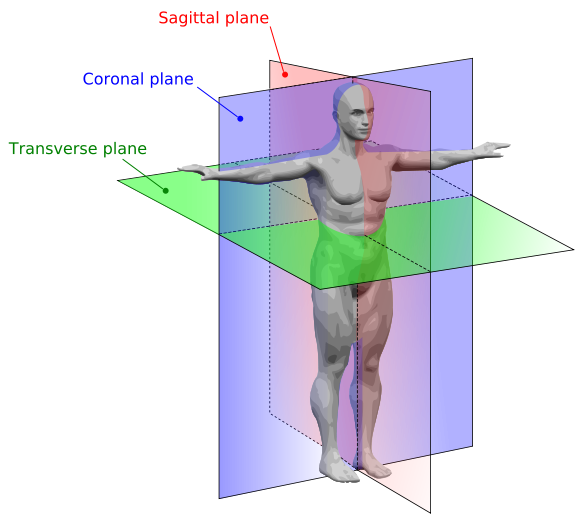 Both motions occur anatomically in the sagittal plane. And spinal rotation occurs in the transverse plane when the spine turns around its own axis; that is, when it twists to each side thus rotating the pelvic and shoulder girdles in opposite directions. Traditionally, a fourth category of movement is also attributed to the spine: lateral flexion. For exercise purposes, however, lateral flexion (or side bending) will only be considered a quasi-fourth type of movement, as there can literally be an infinite number of directions of lateral flexion, which can occur around most of the entire orbit of the coronal and sagittal planes. Further, lateral flexion of some magnitude can (and does) occur as a by-product of all three of the main types of spinal movement, regardless of anatomical plane adherence. While lower back and abdominal-type flexion exercise is routinely recommended as a necessary part of a total body strength or rehabilitation program, torso rotation exercise is often neglected. In part, this has to do with the dearth of equipment for stimulating the spinal rotators, but for the most part, spinal rotation is a puzzling type of movement. It requires unilateral work necessitating greater set volume, and the structures involved are usually quite weak to begin with, making the exercise feel awkward and uncomfortable. But overlooking the spinal rotators in any sound exercise program can have truly unpleasant consequences. Age-related sarcopenia can lead to severe wasting of the structures, and many of the waistline muscles are at the front line of this insidious assault. Today, over 65 million Americans suffer from back pain. In fact, back pain represents the second most common reason that anyone visits the doctor. Quizzically, treating back pain has become the ire of physicians because there is often so little that they can do to help. Most doctors prescribe passive therapies like NSAIDs (nonsteroidal anti-inflammatory drugs) or muscle relaxants. Others do nothing at all for this common ailment, citing that the greater majority of back pain will resolve itself over time. But for many, back pain doesn’t resolve itself. As more muscle is lost from inactivity and age, there is diminished range of motion in the spine, which in turn decreases support for any spinal movement as well as decreases overall trunk stability. Eventually, the lower back and waistline muscles become so weak that the surrounding structures also begin to suffer, leading to greater tension, stress, and a vicious cycle of inactivity and pain. As the muscles shrivel further over time, there is greater likelihood for injury. Ultimately, the condition becomes chronic and sufferers can fall into deep despair wondering if they will ever be able to move with the ease they once enjoyed. But there is hope. With a comprehensive program of strength exercise for the muscles that extend, flex and rotate the spine, almost everyone can enjoy a strong, pain-free lower back. By stimulating strength in the muscles of the spine, including the numerous rotators, you can create the foundation for a midsection that not only resists injury, but one that can recover much faster, should injury occur. Active vs. Passive Restraint: Testing or Exercise? In his book The Lumbar Spine, the Cervical Spine, and the Knee, Testing and Rehabilitation, Arthur Jones claimed that the muscles that rotate the torso are second in importance only to the muscles that extend the lumbar spine. His approach to torso rotation exercise was to restrain the working subject thereby physically blocking the unwanted behavior of the pelvis. To accomplish his testing and research, Jones developed the MedX® Medical Torso Rotation machine—a towering, sophisticated, computer-assisted instrument that featured an impressive and elaborate restraint system that could effectively block the unintended structures during rotation. With this machine Jones could factor out stored energy (torque), delimit range of motion to prevent potentially injurious activity to the lumbar region, and digitally graph the strength curve of the working subject. Jones suggested that with no movement of the pelvis, full range of the spinal rotation is 60 degrees to either side of neutral, a total of 120 degrees. With the pelvis restrained, Jones’ research showed that nearly all spinal rotation occurs above T11, and that any meaningful rotation below T11 is prevented by the interlocking relationships of the vertebral facets below T11. 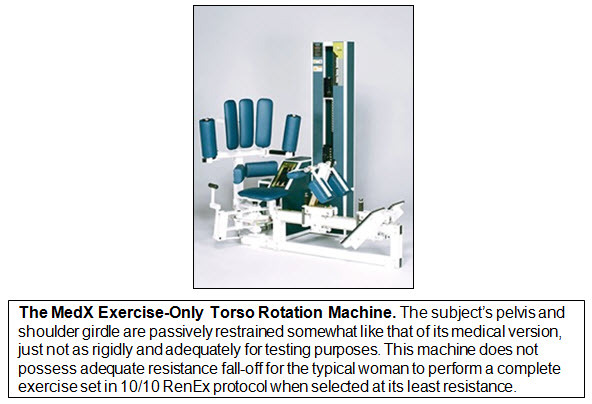 From this research, a smaller, exercise-only Torso Rotation machine was developed by MedX under its Core® brand with a similar (albeit less cumbersome) restraint system as that employed on the medical machine. Realize that both the medical and exercise machines have a passive system of restraint, much like that used on the MedX Medical Lumbar machine. A passive restraint system is one whereby the equipment automatically acts upon the subject by physically blocking unwanted behaviors. In general, passive restraints are easier for the working subject, because there is less to think about and control during the excursion. The restraint basically does all the work. However, while a passive system may block the unintended structures from contributing force to the movement arm, it cannot inhibit their intense endeavor to do so. A passive system is a necessity for conducting testing procedures such as the static testing done on the MedX. But passively restraining the pelvis may not be the best approach to exercise. In static testing, without the controls and physical delimitation of a passive restraint, it is impossible to meaningfully measure—not only the intended action of trunk rotation—but also the unintended, ancillary movement of the pelvis, as Jones said. But passively restraining the pelvis in exercise means that the subject may be unnecessarily limited in not only healthful and productive range of motion but also in his ability to recruit all the possible structures that can be stimulated in rotation of the torso. It also possibly interferes with the design of the correct resistance curve in this critically important exercise. The RenEx Rotary Torso machine was conceived with an active restraint system for the pelvis. Ken Hutchins intended this machine to be used in a completely different manner than the MedX. In Ken’s design, the working subject must actively participate in sustaining the correct body attitude during the entire excursion, including proper body positioning as well as pelvic management. While this is certainly more complex and charges the working subject with significantly more to think about during the exercise, the end result is an exercise that involves more of the associated muscular structures. An active restraint system also positions the subject in such a way as to neurologically preclude undesirable actions rather than to block them. Stated differently, the muscular control required to stabilize the pelvis naturally blends with the action of the torso against the movement arm creating a coupling that automatically helps to prevent unintended behaviors. As such, an active restraint requires the subject’s volition to establish restraint through the control of reactionary forces. The subject must concentrate on performing not only the target action of the muscles to rotate the torso within the guided path of the machine, but also on the control of secondary behaviors. Upon a cursory glance, this may seem like a long list of muscles for what appears to be a relatively isolated type of movement. But in fact, axial rotation of the trunk requires a tremendous synergy of structures, not isolation. 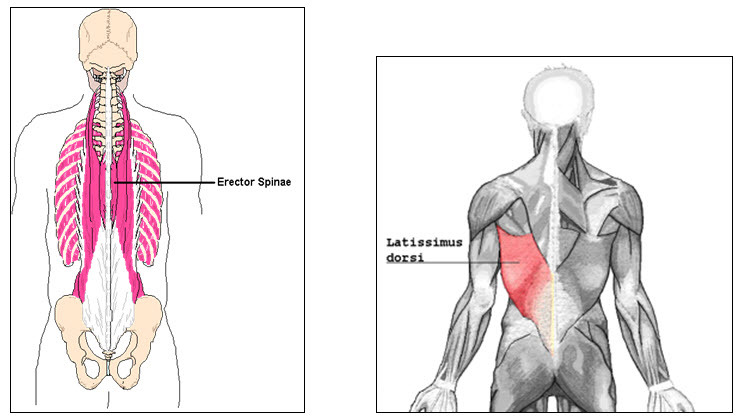 The real king of torso rotation is actually the latissimus dorsi. The obliques are actually only a distant secondary player. It was Ken Hutchins who first suggested that the latissimus is the most powerful rotator. 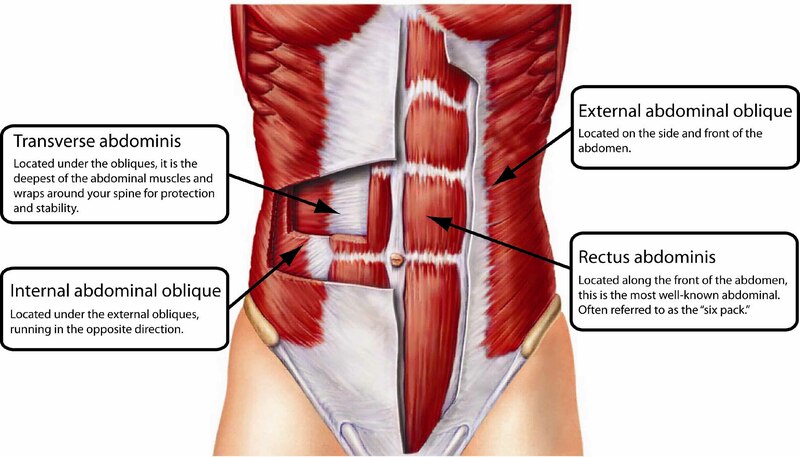 Realize that in most people, the posterior fibers of the external oblique are overlapped by the latissimus. As such, a properly built Rotary Torso machine is designed to facilitate involvement of the latissimus musculature as well as all of the other involved structures. 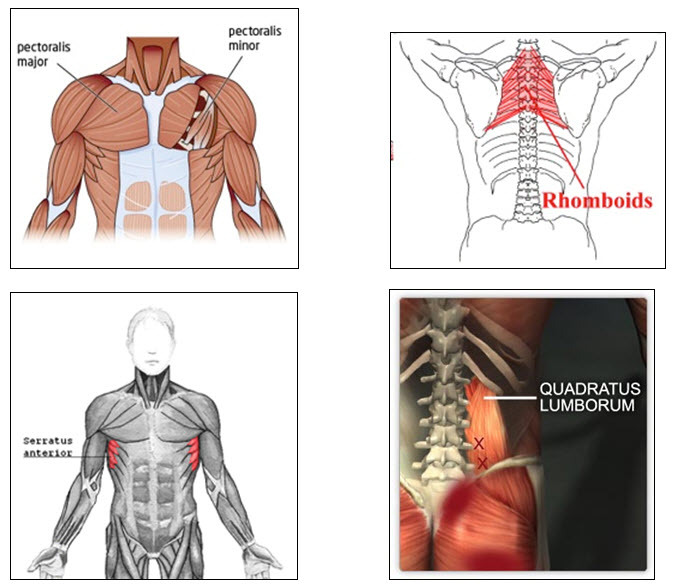 The pectorals and rhomboids, for example, are involved in torso rotation, in part, because of their attachments (the rhomboids attach from the vertebral column to the medial border of the scapulae), and, in part, because of their relationship to each other as opposing structures. Sit upright in a chair with your feet flat on the floor. Imagine that you hold a two-foot-long, wooden 2 x 4 tightly to your upper chest as you simultaneously squeeze a pillow between your legs. Doing this, rotate to the right without moving your hips or arms. Once you have rotated as far as reasonably possible, pause in this position and then try to approximate the right shoulder toward the left buttocks. Of course, this is physically impossible, but the imagery permits you to achieve a tremendous muscular contraction. Also note this approximation is exactly the sweeping, oblique tracking of the latissimus somewhat around the trunk! Another way to envision this idea is to imagine your entire back as a legal envelope where the shoulders and hips represent the four corners of that envelope. As you attain the tighter position of contraction, pretend that you are trying to touch the opposing corners of this envelope. If you perform this visualization successfully, your latissimus muscle will generate forces equal to that of your oblique and abdominal muscles and may even spasm. The human body contains exact relationships between the joints and the muscles that move them. If a joint is capable of performing a particular action, the muscle(s) is (are) capable of powering that action (unless it is blocked from doing so). And the muscles are set in the body in antagonistic groupings, which naturally balances them. Look again at the list above and you’ll note a pattern of opposing structures emerging. When a particular muscle is contracting with intensity, its antagonist yields, but still offers enough tension to steady the moving part(s). Nowhere is this more evident than in the action of trunk rotation. As one of the few exercises in a RenEx program that is unilateral by necessity, torso rotation is—in essence—a study in the comparative opposition of muscle-joint systems. Performing left-bound rotation causes contraction and stretch in structures that invert upon performance of subsequent right-bound rotation. This is particularly true as a greater position of contraction is achieved and the visualization above is practiced. This reverse, secondary side-bending aspect of the rotation is a necessary element if we are to have the most intense torso rotation experience and recruit the greatest number of structures. Ironically, machines that feature passive restraints may inhibit the involvement of the total number of possible structures precisely because of the blocking effect of the restraints. They are designed to isolate rather than to include. In fact, in such machines the visualizations discussed earlier at the finished position are difficult to even initiate because of the physical intrusion of the upper and lower body restraints. 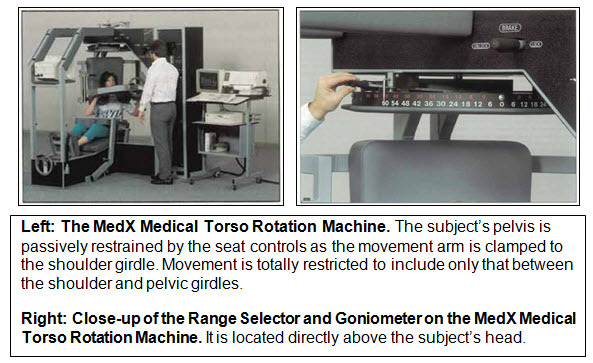 Conversely, the recruitment of the number of structures listed above in trunk rotation is truly possible only in the RenEx Rotary Torso machine. Similarly designed machines may permit the active restraint of the RenEx machine, but they possess inadequate resistance profiles to provide the necessary falloff toward the contracted position. Without sufficient resistance falloff the subject will often jab and off/on repeatedly as he approaches the most contracted position, making the exercise very erratic. In many physical therapy circles as well as in some fitness disciplines, isolated spinal rotation exercises are strongly admonished. This is true regardless of the modality used: machines, calisthenics, or whatever. In most cases such opposition comes from concerns over what does and does not rotate in the human spine as well as the idea that isolation-type exercise is not salubrious. Regardless of the admonishments, those admonishments (mostly irrational) must be considered in the context that the rotation is conventionally performed exceedingly fast. And as we continue to harp, proper control is impossible without a strict adherence to the RenEx protocol (10-second positive/10-second negative). Without this, the resistance curves might as well be non-existent, the stretches are outright dangerous, the squeezes are superfluous, and all standardization and meaningful record keeping are worthless. Generally speaking, although the spine permits rotation, most trunk rotation occurs in the thoracic spine with very little rotation possible at the lumbar spine. As Jones indicated, if you try to twist the lumbar spine too far, it breaks, because it is designed to actually limit rotation. The concern over the relative safety or effectiveness of torso rotation machines has to do with the effect of pelvic stabilization as a contributing factor to possible injury of the lumbar structures. While it may be true that passive blocking of the hips may pose a threat to hip and pelvic integrity, such concern is moot in the RenEx machine. Realize that “passive restraint” is also synonymous with “unguarded restraint” and “external restraint.” With active restraint, by contrast, the pelvis musculature is tensioned guardedly and with internal muscular control that does not merely relinquish protection to come what may from the tendency of its components to deform and disorganize within those otherwise passive constraints. In the RenEx Rotary Torso, the subject is required to adduct the hips statically during the excursion. This is the active restraint system discussed earlier. Technically, however, this is not truly a restraint at all: As mentioned earlier, it is more appropriately a coupling that serves to arrest reactionary forces. Statically adducting the hips actually directly opposes the action of the torso against the movement arm in rotation. The intent to adduct helps to stabilize the pelvis and promote greater involvement of the target structures while enabling greater control of the movement arm at both extremes of the range of motion. The coupling effect also allows a more natural and predictable movement of the torso, one that is not only very safe, but also ideal for the unique resistance curve on the Rotary Torso machine. Most of the machines in the RenEx Lineup modulate resistance via the use of off-centered pulleys known as cams. In some cases, the cams can be individually timed to the specific needs of each subject via a hand-wheel that can advance or retard the cam’s timing relative to the body’s position. The Rotary Torso, by contrast, features a far simpler mechanism, but one that is no less fascinating. It incorporates a natural lever or, as Hutchins refers to it, a harmonic lever. This elegant instrument delivers a remarkable 12:1 peak resistance falloff. This broad range of resistance variation is critical to the needs of the working subject, and is the key feature that truly distinguishes the RenEx Rotary Torso from any other machine. Great technical detail regarding the harmonic lever and its many variants is featured in The Renaissance of Exercise—Volume II by Ken Hutchins. It is expected to be released later this year. With this technique, unlike the typical turnaround pattern in a standard repetition, the subject is required to progressively increase his range of motion—at both extremes—over the first three repetitions. To accomplish this, the subject is required to load at the neutral position. From there, he must perform a partial negative to essentially get to the start position (or the stretch). But this first stretch must be only a moderate stretch. After a two-second pause he performs the first positive as far as he can rotate, but only by using a moderate effort. After a two-second pause at the finished position, the first full negative will follow. At the lower turnaround there is another two-second pause, but this time to a slightly deeper stretch than before. The second positive proceeds into a rotation with a slightly greater effort than the previous repetition, and the finished position is also paused for two seconds. At the end of the next (third) negative the subject stretches as far as possible at the lower turnaround while maintaining the correct behaviors, and sustains the stretch for a full five seconds. As the subject rotates fully on the next positive, he performs the squeeze technique for another full five seconds. The emphasized lower turnaround facilitates a healthful and therapeutic stretch while the squeeze technique at the upper turnaround (with the assistance of the harmonic lever) enables the subject to maximally congest and contract all of the target structures that facilitate torso rotation for a truly exquisite exercise effect. One particular benefit of torso rotation exercise, however, is in the treatment and management of scoliosis. A number of research studies have shown that torso rotation strength exercise can actually stop curve progression in small and moderate curves, and that many curves have been reduced. Additional benefits include pain reduction and increases in range of motion. For many adolescents who have been diagnosed with idiopathic scoliosis, torso rotation exercise can be a more desirable and effective option than the more passive therapy of using a body brace. The Rotary Torso is remarkably easy to use and features a simple 3-position pop-pin adjustable movement arm that exceeds the subject’s range of motion. This facilitates optimal use of the harmonic lever at the upper turnaround, allows for a rehabilitative true stretch at the lower turnaround, and permits the instructor to assist loading the subject via interpersonal transfer. The movement arm also has the ability to completely orbit the seated subject, which enables the instructor to conveniently switch from left-bound to right-bound rotation. Entry and exit is straightforward, and a dual level footwell accommodates various leg lengths. Dual handles on the movement arm provide an appropriate handgrip to help keep the torso against the chest pads. The upholstery on the seat, chest and thigh pads is carefully crafted to help the subject establish excellent maintenance of the correct body attitude during the excursion, as well as to provide maximum comfort. As with all of the RenEx machines, the cable-driven Rotary Torso machine is furnished with the RenEx Ultraglide™ top plate and Freedom Stack™ for low-friction operation. It also possesses a range delimiter that features stops in quarter-inch increments for true precision in tailoring the user’s endpoint, when desired. An optional load cell at the endpoint stop assures accurate load-sensing technology is always available to measure squeeze technique effort as well as providing the foundation for reliable, independent timed-static-contraction (TSC) exercise at various positions in the range of motion. Like the Overhead Press and Simple Row machines, a lighter (15-lb) aluminum top plate and 1.25-lb weight increments assure that even the most debilitated subjects immediately begin to enjoy the remarkable benefits of this unique machine. And for those who are more vigorous, the Rotary Torso can become a secret weapon to help optimize results in the waistline musculature. Athletes using the machine can expect rapid strength gains, truly enhanced flexibility, and an improvement in performance of many activities and sports. Imagine increased club-head speeds on the golf course, more powerful slapshots on the ice, and more rapid returns on the tennis court. In fact, there are few activities that won’t benefit from stronger, more capable rotators. With its straightforward design and simple operation, the Rotary Torso provides a small footprint, a less confining cockpit, greater range of motion, and an unparalleled resistance curve for the most potent stimulation of the associated muscular structures. Looks great I forgot the price tag? Prices are by appointment only, give us a call. I haven’t read the entire article yet but just had to say this is great! I have been of the mindset, for a long time, that one would benefit greatly from addressing ALL the bodies muscles/muscle groups. I have had some limited experiece with various torso machines. This is one of those movements that I have a fear that I maybe doing damage rather than making myself stronger. Again I see where it all comes back to volition of the subject and the equipment getting out of the user’s way. Also the muscle synergy stuff written about here and in some previous Renex writings have been very thought provoking. Great stuff! Making the passive into active & volitional makes complete sense, as muscle structures contract or are tensile in synergy with one another without being in a piece of exercise machinery, replicating these conditions as best we can would maximize the results we are seeking to attain. RenEx articles deliver a learning value far beyond the ‘salesmanship’ of other companies. Evidence, fact & practical application out in the field will reinforce this. We really appreciate your feedback and support. You’re welcome Joshua. 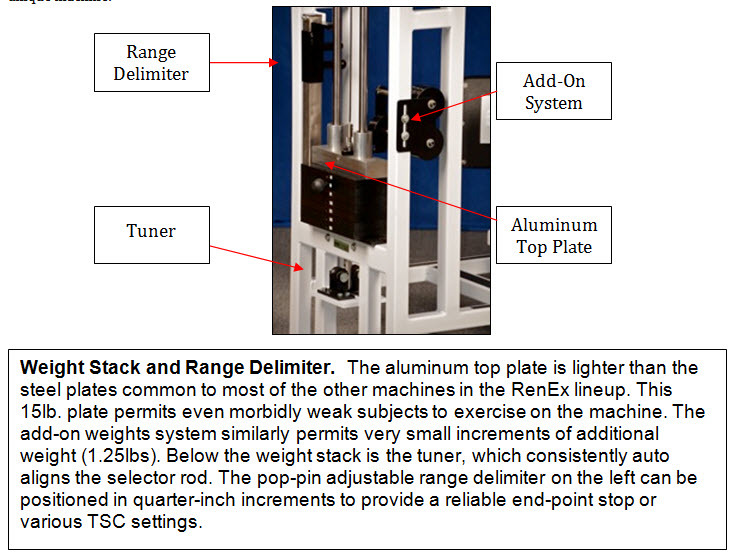 The more I read the Renex stuff the more the I get what you mean about the equipment being designed for the protocol. I’ve asked you guys questions relating to conventional equipment and while I know some of the basic principles apply, ideally Renex protocol requires Renex environment. 10/10 won’t work properly or as efficiently without proper camming, positioning, movement patterns, etc. Getting under or two far over this speed will throw of the stimulus and take away from the safety aspect because it goes against how the equipment is designed to be used. I understand also that immediate transfer to the next exercise is very important and I’m assuming there are details that determine what is the best next exercise or movement to go to during a session? The writing in this article about the gradual range increase during the movement is very interesting as well. I believe your questions are all answered in the technical manual. And…..as far as recommendations go for conventional gym equipment Ken and I are working on this project for the fall of 13′. The prototype is there in Beachwood. I want to clarify something that I have been asked about a few times. Gus Diamantopoulos is not employed or compensated in any way by RenEx. He is an independent consultant who believes in The RenEx philosophy. He does own all RenEx machines which he has paid full retail price for and he has a thriving practice in Toronto. He fills all of his available appointment (at a premium rate) times and has quite a long waiting list for new subjects. Gus is also training me two times a month in preparation for a return to bodybuilding. We will be sharing these workouts and progress on the new private site. Not backsliding I hope. Leave the bodybuilding to the goons and intellectually dishonest who want to bicker on posting boards about irrelevancy, and get on with the science of health. I don’t think this is the forum for discussing recreational pursuits, ill advised or not, and I’d be real disappointed if you use the results of this bodybuilding experiment(misadventure) to say anything about Renex, because then they have won. That being said discussion about increasing lean body mass and losing fat mass will always be relevant. To a point I’d agree, but for what concerns health,what concerns 99% of the population and what concerns the practical, whatever bodybuilding is -it has no part in it. Bodybuilding is a manifestation of an obsessive compulsive psychological disorder. Maybe your intent is to show how little attention one needs to apply to be successful at it when utilizing Renex principles, but this still does not discount the overriding genetic factors inherent in the success of the activity, nor the second handed nature of leaving your success otherwise in the hands of strangers who subjectively judge your genetic limitations. I wonder if every second of this endeavor were put to some improvement of Renex engineering or technique, what would be accomplished? Maybe that’s what you think you’re doing. I wonder if this endeavor is taken up to answer the peanut gallery of would be bodybuilding internet trolls? Like trying to educate the religious against the non-thinking of faith…pointless. Bodybuilding is wasted on anyone. Have a look at what we’ve put out in just two years….I can promise you that there isn’t a way to add more than what we’ve done, it is the result of the team putting in many 12 to 16hr days over this period… yes, for me, bodybuilding is an obsession…one that would not be afforded to me if it were not for RenEx . I can work 12 to 16hrs a day, 7 days a week, and still enjoy my bodybuilding hobby while investing less than 1hour/week training. I’m pretty obsessive about RenEx and my bodybuilding and for me they go hand in hand. There is no way I’m turning back on the thing that helped me find this in the first place. Below is a direct quote from this website taken from teh comments section of the Flying – Just a Theory article. What changed? Have I misinterpreted? Are you going to be competing or just getting into “shape” for Darden style before and afters? I’m less interested in what Arthur Jones has said about bodybuilding and more interested in what Ken Hutchins has to say about exercise. Ken Hutchins literally saved me from many of the compulsive behaviors that go along with the lifestyle of being a bodybuilder. It’s not a productive way to live. Once upon a time I was spending a couple hours a day in the gym…now I don’t. I use this time to develop RenEx. Am I obsessive with regards to the business, bodybuilding, my workouts, diet, our equipment, study?…some would say yes. You can look at this as positive or negative, but none of RenEx would exist if this wasn’t my nature. I think bodybuilding, in its purest sense, is a beautiful thing. I intend to prepare for the Professional Mr.Universe. To each his own I guess. Something is not jiving intellectually here for me, but I’ll leave it alone and eagerly await Ken’s next installment of ROE. Just saw the pulley’s over at Darden’s…wish I could have seen them here. You did well for only $10K, not counting the time of all of those involved. Being a fitter/machinist, the manufacturing process is something I can appreciate as much as the exercise technique. I was thinking of doing a blog to report performance, but I don’t even have the part yet. There will be more to come…..
And you are right few understand the time, effort and money to bring this stuff up from scratch. Upon reflection of this machine, my overall impression is that is a one-in-all stop exercise (perhaps one more step is required) for pregnant women or women who have just given birth. Excluding the multifidus for support of the spinal column, this machine seems to cohesively activate and stimulate all of the musculature that is required for women who must 1) carry a developing fetus and, 2) deal with day-to-day tasks involved with raising a child and maintaining a home soon after returning from the hospital (especially women who have Caesarian sections). Given my instruction experience, I found it effective to instruct women on a hip adductor exercise (hip adductors), a Medx lumbar extension machine (multifidus and- to a lesser extent- erector spinae), and a pulldown/chin up exercise (latissimus dorsi, rhomboids, pectoraels, rectus abdominus, serratus anterior, and- to a lesser extend- transversalis abdominus and obliques). The quadratus lumborum may be adequately stimulated by one or more of these three exercises but I am not 100% sure. The only musculature that is lacking is the mutifidus, but other than that, this seems to be a highly cohesive integration of all of the musculature required for mothers to safely and effectively nurture their babies. If the RenEx hip and back machine is able to stimulate the multifidus without passive restraints that compel the subject contract her legs during the exercise, the RenEx rotary torso and hip/back may be the best two stop workout. Thusly, I am curious if you (or anybody else) has evidence or experience aiding pregnant/nursing women and what the impact of this machine has had. Improving one’s golf swing or improving ones batting average is one thing, but being able to prevent half of the population from suffering deleterious effects of child birth is quite another. OMG! Another game changer! Has the media been notified? I haven’t a clue if it works any better but it sure looks a hell of alot simpler than the Jones machines of the past. As Kalashnikov would say, simple is better. Very interesting, – but for the vast majority of the training World, who will never get the chance to try/use Ren X, or that that matter MedX, Nautilus etc, what options do we have ? Not a criticism folks, just an observation from a jealous lifter, several thousand miles away from these lovely machines. Perhaps you can get some out of those machines used with TSC….. This makes me want to rip apart the hated MedX Rotary restraints and bolt a piece of plywood into the center-line. How hard could it be? Then you have the cam issue and a few other things….this stuff is never easy, I wish it were, but because it isn’t we were forced to build machines from the ground up. It’s actually easier to start from scratch than to try to make something work in a way in which it wasn’t designed. I would be interested to know where you recommend placing the Rotary Torso in the workout and what would determine that? We’re writing a book on program design. If I may say, I think that you and Josh are more on the same page then you might think. He just likes bodybuilding and big muscles, nothing wrong with that. We all want to change people’s lives through RenEx Exercise, whatever attracts people to it is fine. I am so excited about these pulleys. I heard a report from Gus that they are pretty awesome. Sorry about posting on Dr. Darden’s before you guys could comment on your site. In the end they are just pulleys, did not think they would deserve a special report/blog on your site. Again, sorry if I offended anyone posting on Darden’s site. They are RenEx parts…. Jeff is referring to an incredible labour of love that he conducted with the assistance of some very devoted specialists and engineers to develop a pulley. But this is no mere pulley. The level of care, precision, and overall quality of the finished product can scarcely be put into words. It is actually engineering art. Form and function at their highest order. The sheer feel of the thing in your hand brings joy. My thanks go to Jeff for not just producing such an incredible design but for his utter generosity, his dedication, and his unceasing vision and capacity to think outside the box in the realm of exercise machine innovations. I enjoyed this, Gus. It gave me some serious refinements to try on myself and with clients. Thanks. RenEx The best machines in the world! Perhaps RenEx should build space ships. I thought they did under the name of SpaceX? It would be wonderful if RenEx built spaceships. They could load up and take their fairy tales to outer space and open a whole new market. You acted crazy for years at Dardens and now here. Problem when you are crazy is that you dont realise it yourself so if the moderators could eliminate this guy once and for all it would actually be quite nice not to see his low-tone comments. Space shots, couldn’t have said it better. The man that tried RenEx for a week and “gained” 10 pounds of muscle. The Jonas that gushed and fawned over Josh in an open letter like a pie eyed teenage girl with a crush talking about his house and car. Lol….You will feel like what you are if you actually take time and go back to read the letter you refer to. Josh and friends like my replies. All this will have little effect if MDs don’t insist that patients take an active role in their well-being. Being in my 60s, I have numerous friends with back problems. Their doctors have them all convinced that every disorder’s congenital. Really? Funny how these “congenital” issues didn’t manifest when you were younger & stronger! And, of course, why bother to exercise, if your condition was your destiny?